Shane at ThinkGeek.com was awesome enough to not only send me one of their amazing products to review but also let me choose what I wanted. Yay! .. After what felt like forever searching, searching, and searching some more, I finally went for Angel Eye $119.99. This little gadget is amazing! I felt like a true spy with this compact spy camera. It came with different size buttons (Tiny video camera looks like a shirt button) for multiple use for different shirts and even a screw button. With it's long cord you are able to use with ease. It came with a durable battery and a great wall charger also. The image screen was crystal clear and the images are better then my regular cam recorder. The screen gives you the options to pause, rewind, fast forward, pause, and stop. I was able to use it within minutes with no fuss. No one knew I was using a spy cam because the buttons are so realistic. I loved it. 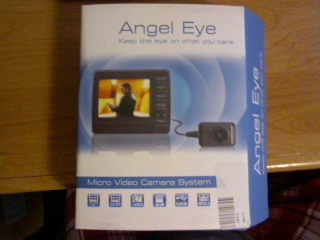 It records video and audio with it's pocked sized DVR so you can take it and use it anywhere. Birthday party's, graduations, concerts, and more! it has a External Memory: mini SD card (memory card NOT included) so you can buy a bigger memory card size for longer lasting memory usages which is great for any occations. ♥ I receive no monetary compensation for this review. I was provided Angel Eye to try and give my honest opinion.